Next home game: 14 April Double Header! At our next home game, our Canny Belters will take on Central City Rollergirls and our North Cs will Middlesbrough Roller Derby B team! 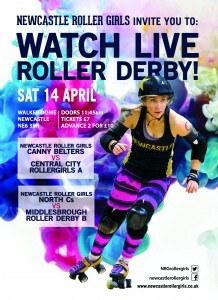 Newcastle Junior Roller Derby will also take on The Roller Stop Reckers from bonny Scotland. Newcastle are currently at 62 in WFTDA rankings with Central City ranking at 94. It’s set to be a great game, so get ready to hold on to the edge of your seat! Tickets are 2 for £10 in advance, or £7 on the door. Book online here.